I just installed Skype on the MacBook Pro. My missionary sister wants to be able to talk to her kid brother on the cheap so we're trying to set that up. I just wonder, are there any Frankly Speaking readers out there that have experience with Skype? What can you tell me about it? I'll admit it . . . 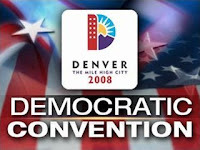 I haven't seen a moment of the DNC in Denver. This week has just been too busy for me to go near a television. Can some of you let me know what I am missing, please? Looking forward to reading your comments. Medals, metals, and mettle . . .
Dan Wetzel, writing for yahoo.com, explains that the United States had better get used to being beaten out by the Chinese in the medal count. In China children are taken from their parents and trained in the sport most appropriate to their body types, so it seems likely that he is right. Here in the states, athletes leave college and go to the NFL or some other professional league and make millions. Chinese athletes don't have that option. According to Wetzel, they're state property. What is more, the Chinese have targeted solo medals rather than the team sports. It takes fifteen softball players to win one gold, but dozens of gymnasts, swimmers and weight lifters can each take medals home. The end result: the USA had better get used to being second in the medal count. So I propose a new method of accounting medals. Simply take the total medal count from the mint - every medal they stamp - and divide them accordingly. 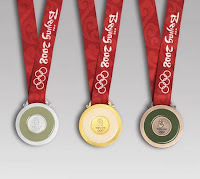 So, when the men's hoops team wins gold, we'll put 12 gold medals in our column. When 14 . . . er . . . 16 year-old He Kexin wins gold on the uneven bars, we'll place one tally in the Chinese column. We do the same for each individual and each team sport. I would be interested to know how the US fares with that sort of accounting. Given our dominance in many of the team sports, I suspect we'll win the medal count, or at least hold our own. If not, we'll have to hope that the Chinese decide to stop being the new East Germany, in order to keep up. I own two, actually. Sold the one in Indiana on land contract, but technically I still hold the paper on it. Apparently that is six less residences than are owned by the John McCain family. The Obama campaign launched an impressive ad after, when queried, Senator McCain was unable to say exactly how many houses he owns. According to a politico report several of the homes, which are all owned by either Cindy McCain or her dependent children, provide housing for the McCains' children and even Cindy's elderly aunt. I'm thinking that Senator Obama might want to be careful with all this talk of housing. After all, he purchased a million dollar home from a now-convicted felon through what some are saying were shady circumstances. Even if completely on the up and up, one wonders why John McCain is so quickly criticized for owning homes in which his children, grand-children and wife's aunt live while Barack Obama's brother calls a tin shack in the heart of the Nairobi slums home. If there isn't there room enough in the Obama mansion for his half-brother, perhaps Senator McCain would be willing to share a residence or two with Obama's younger brother George. Frankly funny . . . Some of the funniest satire I've read in a while . . .
Wayne Smith, a well-known preacher from our brotherhood of churches, was once asked, "Wayne, what would you do if someone won the lottery and wanted to give the money to the church?" Wayne thought a moment and replied, "I don't care about money's pedigree, just it's destination." 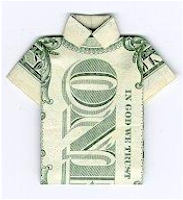 I feel certain that there have to be some genealogical connections that would force us preachers to reject a donation. I wouldn't, for example, want to take funds that were received as a result of anything illegal. The question is: should the church accept funds from something that is merely immoral, if not illegal? And, who is the arbiter of morality in such cases? First Baptist Church in Orange Park, Florida has been wrestling with that very issue. When one of their members, Robert Powell won $6 million in the Florida Lottery last month, he decided to tithe ten percent to the church. The church, however, rejected the $600,000 donation. Pastor David Tarkington politely declined the offer because he believes and teaches that gambling is wrong. Others are not so sure. Pastor Dr. Lorenzo Hall, who leads a nearby inner city ministry said, "I'm against the lottery, but if one of my members won the lottery, I wish and I hope he would give 10% to the church, we could do a lot of things with that money." I've often wondered what I would do if confronted with the same dilemma / opportunity. I've even wondered what I would do if I found myself on the giving end of such a problem. From time to time my father-in-law will buy a lottery ticket and designate it for my wife and I. We've even received lottery scratch-offs from my cousin as a Christmas gift. What would I do if I won? It is a problem that I would prefer to explore, not just in the abstract, but in the concrete in case you're wondering. In the meantime, I'll continue to counsel and preach tithing to the saints at South Lansing Christian Church. Lot's of folks are listening, too. South has been incredibly generous in 2008. In state racked by recession and job-loss, Southies have given more to the work of the church than at any other time in the church's history. Their generosity is incredible. As we grow in this discipline of giving, I look forward to the day when all the members at South tithe. Then we'll have more than enough money to fund all our ministries, grow the church, and pay off our church's mortgage early. Dr. Hugh McKean of Chiengmai, Thailand, tells of a church of four hundred members where every member tithes. They receive a weekly wage of forty stangs (less than twenty cents] and their rice. Of this meager existence, each gives a tenth every week. Because of this, they have done more for Christ in Thailand than any other church. They pay their own preacher and have sent two missionary families to spread the gospel in a community cut off from the outside world. They are intensely interested in all forms of Christian work, especially work for unfortunates of every kind; and their gifts for this kind of work are large. They have not only accepted Christ, but, having found Him good, they are making Him known to others. Oh, by the way, this church of all tithers is also a church of all lepers--every person has leprosy. I heard a preacher say recently, "Ask 'what' not 'why' then wait and apply." I've been doing that today. Had to take Abby to the eye doctor because her left eye was in pain and really, really red. Turns out she has "multiple corneal ulcers." We spent the next hour finding a pharmacy that had the medication the optometrist prescribed in stock. Jonah had his eye doctor appointment, too. But with Abby being squeezed in, his was pushed back, meaning I didn't get into the office until 2:30 PM. Now I am headed out to East Lansing to drop Jonah off at the physician's office for his sports physical. I'm not whining (am I? ), just explaining that the whole "waiting thing" I talked about this last Sunday applies to preachers, too. 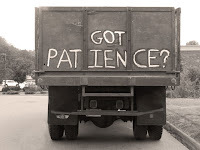 God wants to teach me patience, just like the rest of us. Oh . . . Abby has to wear her glasses for the next month. She's hating that . . .
1. I posted the previous video at the request of someone who knew Dan, loved Dan, and wanted to see Dan being Dan. 2. I know what was in my heart when I posted the comments at the conclusion of the previous post. The funny thing is, I wasn't thinking anything badly about Dan. I completely missed that my thoughts might be construed as anything other than a comment about the humorous human condition we call "life." 3. Dan knows what was in my heart, I suspect, as well. I'm guessing he got a pretty good chuckle. Probably still is as he sees me twist on this one. 4. Nevertheless, one found my comments to be in "bad taste." Another felt I was looking out the window rather than in the mirror (seems I've heard that before). Consequently, I removed the post and the accompanying video. (I'll have to email you the clip, Dave). I think I will take a few days away from Frankly Speaking to contemplate where I am at emotionally and spiritually. If my critics are right (and I respect their judgement enough to consider seriously that they may be), then perhaps I need to get my head in a better place before resuming the blog. The Weller men made their way back to Grand Ledge from The Northmen. Our time at the men and boy's rally was great! The preaching was good, but even better was the time spent around the campfire and in the Manistee River. This Sunday Intern Jonathon and I are preaching about Abraham and Sarah. The sermon is titled, Hating the Waiting. I hope to inspire everyone at South to Ask "what" not "why," then wait and apply. All too often, when God has us in the waiting room, we ask "Why me, God?" A young couple struggles to conceive. A son watches his parent slowly suffer a debilitating terminal illness. A single adult watches as friend after friend marries and wonders how long the wait will be before God reveals her life companion. A teenager wonders is she will ever turn eighteen and be free from her parents' abusive anger. Waiting. We all hate it, I think. I'll admit, I've been blessed. I've not had to wait as long as some folks. Good thing, really. I'm not too patient - certainly not as patient as many I've met. When I do wait, though, I have learned the importance of asking "what?" What is it you want to teach me, God? What change do you want to make in my character? What are you going to reveal about Yourself to me through this circumstance? Asking, "why?" never really leads to anything productive or useful. Asking, "what?" though - that's altogether different. Not easier, mind you, just more useful. Took the fam to Spartan Speedway in Mason, Michigan tonight, courtesy of Ken Coutler, crew chief for the Number 9 JD Wisner Electric School Bus of Tomorrow. It was our first time at the figure eight school bus races, and it is one we'll never forget. Ken always fields a strong bus and this year was no exception. The victim of a bad draw, Ken's bus was forced to start near the back of the pack for the twenty-five lap feature. Within two laps, Ken's driver, Steve, was already moving up when he got into a scuffle coming off turn four. The 9 bus was wedged in between the Number 3, driven by the Mayor of Mason, and the Kitsmiller RV entry. At last year's September race, the Kitsmiller bus rolled Steve on his side. Steve returned the favor this year, dumping the Kitsmiller bus and breaking it's drive shaft. In the fracas, the Wisner bus began losing water. By the time the green flag flew again, Ken's entry was running without any coolant. Just prior to the restart Ken told his driver, "It's a diesel engine and has new oil. I think she'll hold together for another twenty-three laps. " The Wisner Electric cheering section held its breath and crossed its fingers. The next fifteen laps were a dual between the Culligan Water entry and the camo painted Beacon Sales bus. But when they two of them crashed into the wall, the Wisner bus took the lead and began steadily pulling away. With just two laps remaining and with a slower bus ahead of him, Steve looked like he would cruise to victory lane. But it was not to be. The big diesel motor seized up just short of the win. Our hopes were dashed! Nevertheless, we enjoyed a great night of racing with our friends the Coulters, the Maltzans and the Sleights and many others that we've just met. We plan to be back at Spartan September 5 for the final showdown of this year's figure eight school bus races! With crashes like tonight's (shown here in the video below) you can see why!